Yorkshire and wine aren’t too things that are normally put in the same sentence. If you think of things from Yorkshire, your mind goes straight to flat caps, whippets and a nice pint of ale in an old-fashioned tankard. We’re going to go a bit beyond this stereotype and explore Yorkshire food, its qualities and which wines from all corners of the world (including England) it would go well with. Yorkshire food quite simply is food that is made in God’s own county… no, not Lancashire, YORKSHIRE! With it being England’s biggest county, there are many artisan producers who are making exceptional products that represent all aspects of the region. This can range from pork pies, to cheese, to wine. We’re going to explore all of these aspects. Greedy Little Pig are a hog roast company who charmingly boast that they “Go the whole hog”. They’re a small outfit, situated in Huddersfield, West Yorkshire and the company is run by Glen Timmins and Anthony Hegney. If you’re wanting to impress your friends, then it’s definitely worth giving them a call. They can provide as little as the hog-roast itself, or their team of chefs can knock up a range of salads and other accompaniments, so you don’t have to worry about a thing! They even have a partner company called Bubbles and Punch who will take care of the refreshments for you! Sheffield Cheese Masters is Sheffield’s only cheese company. Situated in the Neepsend area of the city, it’s very much an urban cheese house. Owner, Sophie Williamson produces some amazing cheeses, with milk sourced from Our Cow Molly, an independent ice cream company based in Dungworth, just a few miles from the fromagerie. We recommend you try Sheffield Cheese Masters. They offer a range of cheeses (their signature Little Mester is incredible), and engaging wine & cheese pairing evenings. The Leeds Bread CO-OP specialises in sourdough bread. They began in 2012 and have since slowly grown into a reputable retailer for great produce, whilst holding onto their core values of being a co-operative. Their delicious sourdough is made using natural ingredients and traditional methods i.e. making it by hand. It’s a back to basics approach which helps the authenticity of this bread really shine through. The Leeds Bread CO-OP also offer bread making classes, so you can learn the techniques that they use at LBC, take those skills home and then impress your friends when you bake fresh sourdough the next time you have them round for dinner! So far on our top five artisan food producers list, we have been highlighted companies that started in recent years, so naturally we need to show the veterans some love! 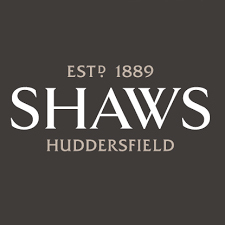 Shaw’s of Huddersfield have been producing chutney since 1889. Founded by Geroge Shaw 130 years ago, they’re a company with family at the heart of things. It’s still run by them today. Matthew Shaw, the great, great grandson of George is the current chairman of the company! Shaws are a great example of keeping traditions going whilst appealing to a large audience. They have two ranges, the ‘Everyday Range’, which consists of preserves common in modern kitchens, for example mango chutney and relish to put on sandwiches/burgers. Then there’s the heritage collection, which range from classic English things such as Piccalilli, to a delicious beetroot and horseradish chutney. Some of their products are stocked by selected supermarkets, as well as independent retailers. Now, you may be reading this and be thinking, how can something be artisan if it is stocked in supermarkets? Well if you saw the size of the team at Shaws, then you’d realise that it’s still small scale, and the fact that they have been recognised by the bigger retailers is a testament to their products! here to find out where you can buy some! 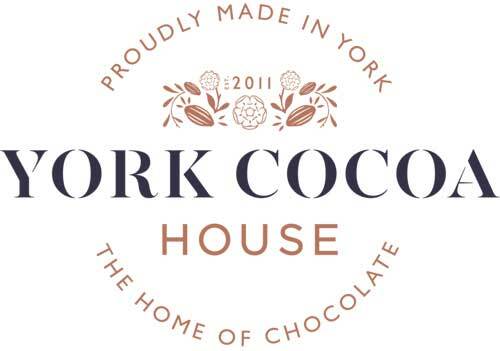 Finishing off our list of top five artisan food producers in Yorkshire is the York Cocoa House. York used to be known as the chocolate city, having previously been home to numerous chocolate factories. These days, that isn’t the case, but York Cocoa House is bringing aspects of that back. Founded in 2011, the York Cocoa House boasts numerous sweet treats, made from premium ingredients. This establishment covers all your chocolate needs, from an on-site cafe, to an online chocolate emporium, to chocolate making workshops and lessons. All this in the heart of York, one of the most beautiful cities in the UK. Is your sweet tooth in overdrive? Why not visit Sophie and the team at York Cocoa House this weekend? Click on the address for directions! As we mentioned, wine and Yorkshire aren’t two words that normally go together, however we do boast an array of award winning wineries. Normally if people think about English wine, they think of the south of England, however it may pay off to focus your attention closer to home. 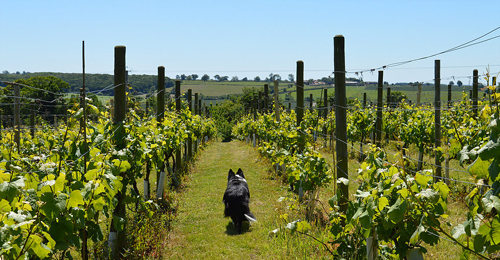 Ryedale is an award winning, family-run winery that was established in 2006/7. Based about 30 miles, north-east of York, it’s at this moment in time, the most northerly commercial vineyard in the country. Due to the climate at Ryedale, expect beautiful, crisp and fruit forward whites & rosé wines, and beautifully acidic and refreshing sparkling wines. They’re a winery after our own heart, as they are a low-spray winery. Basically, they harvest by hand and work in such a way that minimises any effect on the land. Ryedale; like most wineries is situated in the beautiful North Yorkshire countryside, so it’s well worth spending a weekend there. Luckily for you, Ryedale offer accommodation so you can make the most out of it your time there! Ok, so Renishaw is technically Derbyshire, however it’s so close to Sheffield (where I am writing this article) that we see it as a local winery. And to be honest, we’re claiming it as one of the best wineries in Yorkshire, because the wine is that good. The climate at Renishaw, makes it perfect for producing grapes such as Seyval, which you may not have heard of before. It is a hybrid grape that has been cultivated to withstand cooler climates. Slightly similar to Chardonnay, it is often goes through malolactic fermentation and is also used widely in the production of sparkling wines. On that note, the guys over at Renishaw produce one of the best traditional method sparkling whites I have ever tried. We love it at Lightfoot’s and actually sell it in our shop and online store. 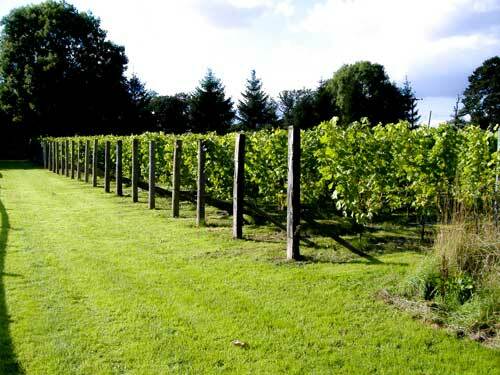 Holmfirth Vineyard is home to the seven-acre Sheveling estate and is very much a destination winery. It offers everything you could ever wish for (not to mention delicious wine). 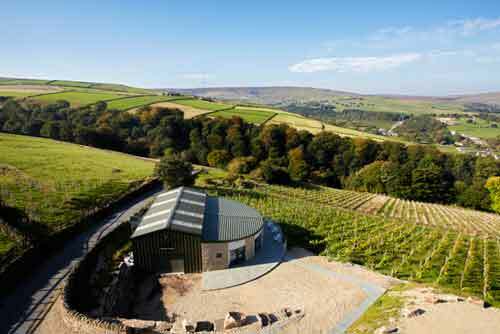 It really deserves to be on our list of best wineries in Yorkshire. This amazing establishment, based in the beautiful rolling hills of West Yorkshire offer engaging and immersive tours, twice a day at 10:30 & 15:00 which last between 60-90 minutes for £10 per person. After the tour you could go for lunch/dinner at their amazing restaurant, with their seasonal menus, or if that’s not your thing then you could always sit down for their delightful afternoon tea. After a hard day of wine tasting and gorging on beautiful food, you will want to relax. Luckily for you, Holmfirth Vineyard offer luxury self-catering apartments! This part of the article is dedicated to iconic Yorkshire/English foods and providing them with a perfect wine pairing. We believe that food should be celebrated, and the best way to celebrate food is to let it be all it can be and pair it with a delicious wine. Forced rhubarb is out of season rhubarb grows at a faster rate than regular rhubarb. It initially grows outside in order to make the roots resilient to frost, and then is transported to dark forcing sheds, where the heat is turned up and the rhubarb grows faster while it is in search of light. The result of this is a sweeter tasting rhubarb with a more expressive colour. It makes for great crumble. Now you’ve made your crumble, you’re going to need a wine to pair with it. We’ve gone for a lovely Riesling Spatlese. Spatlese is a term for German wine made from grapes that have been late harvested. Late harvest is literally what it sounds. The grapes have been picked at a later date, in order for more sugar to concentrate, with the end product being a more sweeter wine. 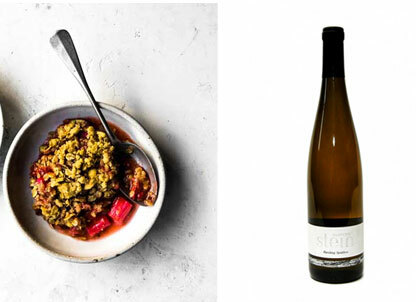 The reason why this dish and this wine go well together is because the rhubarb has a sweet, yet tangy taste to it, due to the way it has been grown, so it will need something sweet and high in acidity stand up to its tastes. Got the thirst for some refreshing Riesling? Well click here to see our collection! Ok, ok, fish and chips isn’t strictly a Yorkshire thing, however it is quintessentially British and Yorkshire boats award winning chippies such Quayside in Whitby and Millers in Haxby, near York. Traditional method sparkling wines are wines that have gone through a secondary fermentation within the bottle and is also known as ‘The Champagne Method’. So, you guessed it! Champagne is a wine that comes under this style. These wines are often reserved for special occasions, but we avidly promote the everyday drinking of sparkling wines as they provide amazing characteristics for food pairings! The high acidity in Champagne, Cava & English Fizz (all of which are traditional method sparklings) stand up to the rich flavours and oily textures of fried foods. 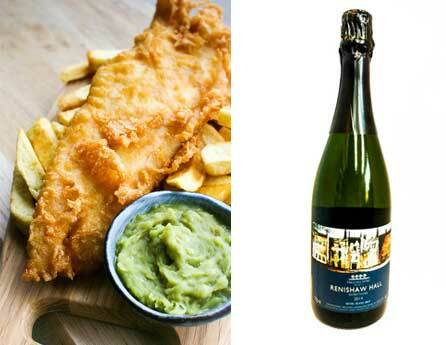 Got a craving for bubbles with your chippy tea? well we have a range of Champagnes that you can view here, or alternatively why not try the traditional method sparkling from our friends over at Renishaw Hall? Nothing says Yorkshire more than Wensleydale. Named, after the North Yorkshire town ‘Wensleydale’, it is a crumbly cheese, not dissimilar to Cheddar or Caerphilly. It coats the mouth and is high in acidity, so is often combined with sweet fruit like cranberries to make great flavour combinations. Wine-wise, we think a nice Chardonnay would go great with Wenesleydale. With the acidity of this cheese, it is important to not go for an overly oaked Chardonnay, so we would recommend something like Chablis, which has lovely acidity, is unoaked and boasts fresh green fruit aromas. Because of the nature of Wensleydale, it is important to not pair it with a heavily oaked Chardonnay, especially if you have something like Wensleydale and Cranberry. The acidity and sweetness won’t combine well with the oak characteristics and make the wine seem flat. If you’re like me, you’re going to be gagging for some Wensleydale and Chablis right now. Luckily for you, we have some beautiful bottles of the good stuff! Click here to have a look. Yorkshire have some of the best venison producers in the country, and Holme Farmed Venison, just outside of Leeds is right up there. This beautiful meat can divide opinion as some people can find it ‘too gamey’. The truth is, venison is a rich meat, but when cooked well and balanced with the right accompaniments, it can be one of the nicest meats in the world (Paul Leonard’s recipe for venison loin is particularly a winner). To compete with such rich and smokey flavours, you are going to need a rich wine. We recommend a red wine that has been produced in a hot climate and we think Pinotage is a good example. South Africa’s premier grape, Pinotage is full of tannin and is normally full bodied. Our Pinotage/Petit Verdot blend, boasts a lovely body, has hints of oak and weighs in at a rich 14% alcohol, which gives it all the ammunition it needs to stand up to this beautiful gamey meat. Salivating for venison and Pinotage? We can’t provide the meat but we can provide the wine. Click here to see what we’d recommend with it! There you have it! Our complete guide to everything relating to Yorkshire food and wine! Don’t forget to share this article with whoever you think may find it interesting and also follow us on social media by clicking on the links below!